Sheer mismanagement and disorganisation have caused a massive headache for potential students of University of Agriculture in the city as they go from pillar to post trying to submit admission forms. Students submitting admission forms complained that simple tasks take hours as they visit various offices. Speaking to The Express Tribune, Latifur Rehman said he came from Mardan and found there was no guidance for new students. After the FA/FSc results are out, admissions are opened at different universities and colleges for the BSc programme. At some varsities, students establish guidance tents for new students. After the October 22, 2014 clash in which a pupil died, the AU administration banned all student federations’ activities hence this year they were unable to establish guidance camps. 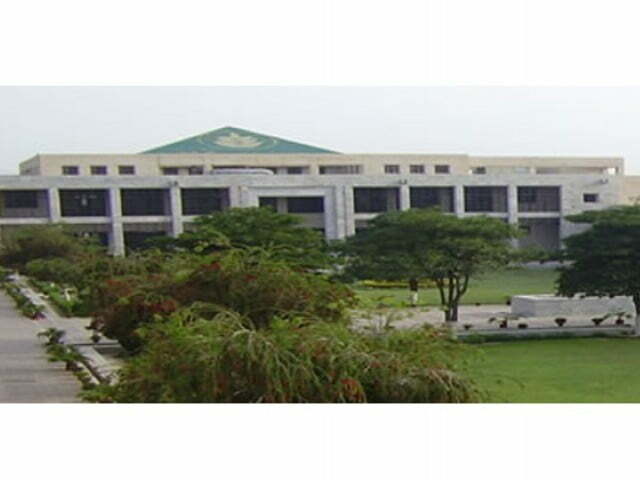 Imamia Student Organisation’s AU Secretary Qamar Bangash criticised the institute administration for the lack of facilities for new students, saying they have to suffer in the blazing heat. He pressed the vice chancellor of AU to take notice of this mismanagement and facilitate students. When contacted, AU Director Teaching Professor Munir Khattak said the institute carefully selected people to handle the admission process and their offices are open from 9am to 5pm. He added the offices remain open even during prayer and lunch time. He claimed not a single student hoping to gain admission had complained so far. “Anyone facing problems can visit my office directly,” Khattak added. He admitted the university administration banned all student federations, but insisted officials are willing to provide all kinds of guidance and facilities. Biotechnology is a technological application that uses biological systems, living organisms or derivatives thereof, to make or modify products or processes for specific use. One of its chief applications nowadays is QTL analysis which deals with quantitative trait loci mapping. First of all, we should have some knowledge about the Quantitative Trait Loci (QTLs) which are stretches of DNA containing or linked to the genes that underlie a quantitative trait. Quantitative traits refer to phenotypes (characteristics) that vary in degree and can be attributed to polygenic effects, i.e., product of two or more genes, and their environment. An example of a polygenic trait is human skin colour variation. Moreover, a single phenotypic trait is usually determined by many genes. Consequently, many QTLs are associated with a single trait. These QTLs are often found on different chromosomes. Knowing the number of QTLs that explains variation in the phenotypic trait tells us about the genetic architecture of a trait. It may tell us that plant height is controlled by many genes of small effect, or by a few genes of large effect. QTL analysis is a statistical method that links two types of information — phenotypic data (trait measurements) and genotypic data (usually molecular markers) — in an attempt to explain the genetic basis of variation in complex traits. QTL analysis allows researchers in fields as diverse, as agriculture, evolution, and medicine to link certain complex phenotypes to specific regions of chromosomes. The goal of this process is to identify the action, interaction, number, and precise location of these regions. In order to begin a QTL analysis, scientists require two things. First, they need two or more strains of organisms that differ genetically with regard to the trait of interest. For example, they might select lines fixed for different alleles influencing egg size (one large and one small). Second, researchers also require genetic markers that distinguish between these parental lines. Molecular markers are preferred for genotyping, because these markers are unlikely to affect the trait of interest. Several types of markers are used, including single nucleotide polymorphisms (SNPs), simple sequence repeats (SSRs, or microsatellites), restriction fragment length polymorphisms (RFLPs), and transposable element positions. Then, to carry out the QTL analysis, the parental strains are crossed, resulting in heterozygous (F1) individuals, and these individuals are then crossed using one of a number of different schemes. Finally, the phenotypes and genotypes of the derived (F2) population are scored. Markers that are genetically linked to a QTL influencing the trait of interest will segregate more frequently with trait values (large or small egg size in our example), whereas unlinked markers will not show significant association with phenotype. The principal goal of QTL analysis has been to answer the question of whether phenotypic differences are primarily due to a few loci with fairly large effects, or to many loci, each with minute effects, thus working for the improvement of crop qualities and developing disease treatments. It appears that a substantial proportion of the phenotypic variation in many quantitative traits can be explained with few loci of large effect, with the remainder due to numerous loci of small effect. Once QTL have been identified, molecular techniques can be employed to narrow the QTL down to candidate genes. One important emerging trend in these analyses is the prominent role of regulatory genes, or genes that code for transcription factors and other signaling proteins. For instance, in rice, three flowering time QTL have been identified at the molecular level, and all of these loci encode regulatory proteins known from studies of Arabidopsis thaliana. The prospect of QTL analysis is dazzling in no doubt. Genome-wide association studies (GWAS) are becoming increasingly popular in genetic research, and they are an excellent complement to QTL mapping. Whereas QTL contains many linked genes, which are then challenging to separate, GWAS produce many unlinked individual genes or even nucleotides, but these studies are riddled with large expected numbers of false positives. Though GWAS remain limited to organisms with genomic resources, combining the two techniques can make the most of both approaches and help provide the ultimate deliverable: individual genes or even nucleotides that contribute to the phenotype of interest. Indeed, combining different QTL techniques and technologies has great promise. For example, some biotechnologists used data on gene expression in fat and kidney tissue from two previously generated, recombinant rat strains to study hypertension. Alternatively, samples adapted to different environments may be compared, or other populations of interest might be selected for expression analysis. This approach permits measurement of hundreds or even thousands of traits simultaneously. Differences in expression may be co-localized with phenotypic QTL that have been previously determined to create manageable lists of positional candidate genes. Other interesting questions concerning gene regulation can be addressed by combining expression or eQTL and QTL, such as the relative contributions of cis-regulatory elements versus trans-regulatory elements. These integrated approaches will become more common, and they promise a deeper understanding of the genetic basis of complex traits, including diseases. Integrating phenotypic QTL with protein QTL can also give investigators a more direct link between genotype and phenotype via co-localization of candidate protein abundance with a phenotypic QTL. Still more kinds of data can be integrated with QTL mapping for a “total information” genomics approach (e.g., eQTL, proteomics, and SNPs). QTL studies have a rich history and have played an important role in gene cloning and characterization; however, there is still a great deal of work to be done. The existing data on model organisms needs to be expanded to the point at which meta-analysis is feasible in order to document robust trends regarding genetic architecture. Data generated by lab-based QTL studies can also be used to direct and inform other efforts, such as population genomics, wherein a large number of molecular markers are scored in the attempt to identify targets of selection and thus genes underlying ecologically important traits. Furthermore, QTL studies can inform functional genomics, in which the goal is to characterize allelic variation and how it influences the fitness and function of whole organisms. Thus, although the map between genotype and phenotype remains difficult to read, QTL analysis and a variety of associated innovations will likely to continue providing key landmarks. Sugarcane is a profitable cash crop in Pakistan and plays an important role not only in agriculture but also in industrial economy of country, Pakistan ranks 5th in the world in terms of area under sugarcane, 11th by production and 60th in yield. It provides employment to nearly 1.5 million people. Its share in GDP and value addition is 0.7 per cent, 3.2 per cent respectively, while per capita sugar consumption is 25-30 kg/year. Its production was reported 62.5 million tons for the year of 2012-13. Average size of land holdings of Pakistan farmers is decreasing day by day due to constant increase in human population. Therefore, in order to meet the ever-increasing food demand such as cereals, pulses, oilseeds, vegetables, sugar is of major importance. This is long duration crop which occupies the land for more than 12 months from sowing to harvesting; in this situation medium and small farmers cannot afford to wait for such a longer period due to the poor economic conditions as well as higher pressure for food to feed their families. Consequently, they tend to reduce the cultivation of sugarcane and increase per unit area for other corps. Since increment in the area under these crops is not feasible due to limited availability of agricultural land, the only option is to increase the crop productivity on the existing land. In this modern era of quick and substantial technological change in the production systems of both in irrigated as well as in rainfed areas of Pakistan. Moreover, the evinced intercropping has one of the most efficient and profitable production systems throughout the sugarcane growing areas and particularly for medium and small land holders with minimum land disturbance and inputs resources. Intercropping has been recognized as a potential system for the augments of productivity over space and time in subsistence farming situations. There is generally a trend toward high yield under intercropping. 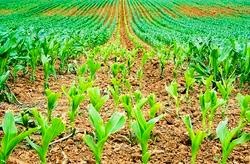 The productivity of land could be improved significantly by growing intercrops in the space left between sugarcane rows. There will be a greater opportunity to grow successful intercropping during the early growth stages of cane. Because sugarcane crop remains in the field for more than12 months and the space between sugarcane rows range from 50 to 90 cm providing sufficient possibility for plentiful weed growth which draws huge amount of nutrients and moisture from the soil. 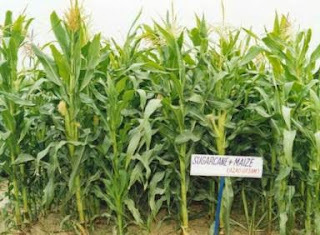 Hence, more space and availability of sunlight for a longer period in the early phase of sugarcane crop provides an opportunity to grow successfully intercrops without any negative impact on sugarcane which not only suppress the weeds capturing the incoming sunlight more effectively so minimum sunlight radiation will be available for germination of weeds. September sown sugarcane plantation occupies more area as well as more duration compared to February sown so farmers have no chance to grow any other crop both of the rabi and kharif seasons. Autumn-planted sugarcane is very appropriate for intercropping because of its slow growth rate during the winter due to occurrence of low temperature. This period can safely be utilized for growing appropriate rabi intercrops which can mature at the end of April without causing damage to the main sugarcane crop. Food legumes (pulses) are the big source of vegetable protein in Pakistan. While per capita consumption of legume in Pakistan is found 15.7 kg per annum. Major food legumes of Pakistan are chickpea, lentil, mash bean and mung bean. Currently Pakistan is importing 0.336 to 0.52 million tons of food legumes worth of Rs. 12.7 to 15 billion per annum. There is a continuous increase in the import of food legumes. Lentil ranks second as food legume in winter after chickpea in Pakistan. Mostly grown in all provinces but major contributing province is Punjab. The production as well as area under production has been decreased which is about 40 per cent mainly due to shifting of farmers from main lentil areas to other crops. The area under cultivation of lentil during 2012-13 was 19.6 hectares while the yield was 9.7 tons. Total area under major food legumes in the country is about 1.5 million ha. The lentil cultivated on 5 per cent of the total area under food legumes and contributes 5 per cent to the total pulses production. Lentil could be a best option for intercropping in autumn planted sugarcane. The total area under sugarcane is approximately 1 million hectares out of which one/fourth is autumn planted. This autumn planted sugarcane has great potential for intercropping of lentil. So, lentil crop as intercrop in autumn planted sugarcane can not only increase the output per unit area a, but also can provide mid-season income which eased the burden on the already depleted income of the farmers and can provide them with an option for better input management for remaining sugarcane growing season. The conservation and sustainable utilization of plant genetic resources is key to improving agricultural productivity, thereby contributing to national development, food security and the relief from poverty. Recognizing the importance of Plant Genetic Resources for Food and Agriculture (PGRFA), an international process on the preparation of Country Report was initiated in 1992 under the auspices of FAO. FAO’s first report on the State of the World’s Plant Genetic Resources, prepared in 1996 from more than 150 country reports, identified a number of serious gaps and inefficiencies in the conservation and utilization of these resources. Based upon the country reports, FAO developed the Global Plan of Action on Conservation and Sustainable Utilization of Plant Genetic Resources which was intended as a frame work, guide and catalyst for actions at community, national, regional and international levels. The present Country Report reviews the current status of Plant Genetic Resources in Pakistan, focusing on (I) State of diversity, (ii) In situ management, (iii) Ex-situ management, (iv) State of use, (v) National programs, trainings and legislation, (vi) Regional and International collaboration, (vii) Access to genetic resources, sharing of benefits arising out of their use and farmers’ rights, and (viii) Contribution of Plant Genetic Resources management to food security and sustainable development. Pakistan is endowed with rich resource base of plant genetic resources due to wide variations in soil and climate, its location in proximity to three of the major centres of diversity described by Vavilov(China, Indian subcontinent and Central Asia) and centre of diversity itself of many crop species. The country possesses many species of wild relatives of domestic crops, particularly of cereals and chickpea. There has been a catastrophic loss in agricultural biodiversity during the last three decades due to introduction of improved varieties in major crops like wheat, rice, cotton, chickpea and maize. Due to little varietal improvement work in minor or underutilized crops, there still exists a lot of diversity in mung bean (Vignaradiata), mash (Vignamungo), brassicas complex, sorghum, millet and horticultural crops. The awareness created by various public and private organizations about the importance of Plant genetic resources has attracted the attention of researchers, planners and NGOs for insitu and ex-situ conservation and sustainable utilization of these resources. For ex-situ conservation, the national program on collection, conservation and evaluation are underway but more needs to be done to fill in the gaps in collection from various areas of the country particularly for the wild relatives of crop plants. 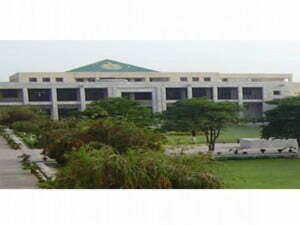 An important step in exsitu conservation of plant genetic resources is the establishment of National Program on Conservation of Plant Genetic Resources at National Agricultural Research Centre, Islamabad which has been able to conserve more than 23000 accessions of various crops including major, minor and medicinal plants. The national program on PGR has a Genebank along with six laboratories for (i) exploration and collection, (ii) seed conservation, (iii) in-vitro conservation, (iv) Germplasm evaluation & characterization, (v) plant introduction and seed health and (vi) data management. The PGRP has the national mandate on conservation, evaluation and distribution of germplasm. This national program is supported by six Crop Advisory Committees which help to identify the priority areas of collection and germplasm needs for specific purposes. Another step recently taken is the establishment of botanical gardens at Islamabad, Lahore and Peshawar. But unfortunately little has been done so far on on-farm management of plant genetic resources. Regarding the utilization of these resources, a number of new varieties of wheat, rice, cotton, maize, sorghum, millet and horticultural crops have been developed which have contributed significantly in food security and sustainable development. Besides high yields, the introduction of these varieties has considerably supported the sustainable management of diseases like the rust in wheat, Ascochyta blight in chickpea, cotton leaf curl virus in cotton and mungbean yellow mosaic virus in mung and mash, as well as better quality in basmati rice. Approximately 2000 to 3000 accessions are distributed annually from the collections of the national Plant Genetic Resources Program to scientific community. The information collected from stakeholders during the implementation of the National Information Sharing Mechanism has revealed that the breeders need the germplasm mainly to address a range of biotic and abiotic stresses. In particular, tolerance to drought and salinity are the most demanded characters. Various universities have included courses on Biodiversity Conservation in their syllabus for graduate and post graduate students. Regarding legislation on access to genetic resources, benefit sharing, farmers’ rights, much has to be done yet as few national workshops have been held during the last 4-5 years. A draft on access and benefit sharing has been developed and is being considered at the appropriate fora. The National Information Sharing Mechanism on Plant Genetic Resources for Food & Agriculture has been developed and available on PARC website (www.parc.gov.pk). For international collaborations, Pakistan has signed a memorandum of understanding on germplasm exchange with many countries. We extend full appreciation to Food and Agriculture Organization (FAO) of the UN for its consistent support, both in the form of technical and financial entities, that enabled us to assemble all the information from national programs after organizing several workshops on the subject to enable the stakeholders in contributing to the contents of the report. Some consumers and environmentalists feel that inad­equate effort has been made to understand the dangers in the use of transgenic crops, including their potential long-term impacts. Some consumer-advocate and envi­ronmental groups have demanded the abandonment of genetic engineering research and development. Many individuals, when confronted with conflicting and con­fusing statements about the effect of genetic engineer­ing on our environment and food supply, experience a “dread fear” that inspires great anxiety. This fear can be aroused by only a minimal amount of information or, in some cases, misinformation. With people thus concerned for their health and the well-being of our planetary ecol­ogy, the issues related to their concerns need to be ad­dressed. These issues and fears can be divided into three groups: health, environmental, and social. People with food allergies have an unusual immune re­action when they are exposed to specific proteins, called allergens, in food. About 2 percent of people across all age groups have a food allergy of some sort. The majority of foods do not cause any allergy in the majority of people. Food-allergic people usually react only to one or a few allergens in one or two specific foods. A major safety concern raised with regard to genetic engineering technology is the risk of introducing allergens and toxins into otherwise safe foods. The Food and Drug Administration (FDA) checks to ensure that the levels of naturally occurring allergens in foods made from transgenic organisms have not significantly increased above the natural range found in conventional foods. Transgenic technology is also being used to remove the allergens from peanuts, one of most serious causes of food allergy. There is a belief among some opponents of genetic en­gineering technology that transgenic crops might cross-pollinate with related weeds, possibly resulting in “super weeds” that become more difficult to control. One concern is that pollen transfer from glyphosate-resistant crops to related weeds can confer resistance to glyphosate. While the chance of this happening, although extremely small, is not inconceivable, resistance to a specific herbicide does not mean that the plant is resistant to other herbicides, so affected weeds could still be controlled with other products. Some people are worried that genetic engineering could conceivably improve a plant’s ability to “escape” into the wild and produce ecological imbalances or disasters. Most crop plants have significant limitations in their growth and seed dispersal habits that prevent them from surviving long without constant nurture by humans, and they are thus unlikely to thrive in the wild as weeds. Impacts on “nontarget” species some environmentalists maintain that once transgenic crops have been released into the environment, they could have unforeseen and undesirable effects. Although transgenic crops are rigorously tested before being made commercially available, not every potential impact can be foreseen. Bt-corn, for instance, produces a very specific pesticide intended to kill only pests that feed on the corn. In 1999, however, researchers at Cornell Uni­versity found that pollen from Bt-corn could kill caterpillars of the harmless Monarch butterfly. When they fed Monarch caterpillar’s milkweed dusted with Bt-corn pollen in the laboratory, half of the larvae died. But follow-up field studies showed that under real-life condi­tions Monarch butterfly caterpillars are highly unlikely to come into contact with pollen from Bt corn that has drifted onto milkweed leaves—or to eat enough of it to harm them. Another concern related to the potential impact of agri­cultural biotechnology on the environment involves the question of whether insect pests could develop resistance to crop-protection features of transgenic crops. There is fear that large-scale adoption of Bt-crops will result in rapid build-up of resistance in pest populations. Insects possess a remarkable capacity to adapt to selective pressures, but to date, despite widespread planting of Bt-crops, no Bt-tolerance in targeted insect pests has been detected. Some consumer groups argue that foods derived from genetically engineered crops should carry a special la­bel. In the USA, these foods currently must be labeled only if they are nutritionally different from a conven­tional food. Most farmers in the USA and elsewhere buy fresh seeds each season, particularly of such crops as corn, green peppers, and tomatoes. Anyone growing hybrid varieties must buy new seeds annually, because seeds from last year’s hybrids grown on the farm will not produce plants identical to the parent. For this same reason—to avoid random genetic diversity due to open pollination—farm­ers do not plant mango, avocado, or macadamia from seed; instead, they clone individual plants of known quality through techniques such as grafting. In developing countries, many farmers who are not growing hybrids save harvested seeds for replanting the next year’s crop. A technology has been developed that might be used to prevent purchasers of transgenic crop seeds from saving and replanting them. Such “terminator” seeds are genetically engineered, along with other improvements more acceptable to farmers, to produce plants with seeds that have poor germination. This forces farmers who otherwise save seed to purchase it if they wish to use these improved commercial varieties. And, in the USA, the crops engineered with various charac­ters are sold alongside nontransgenic alternatives for which growers also typically purchase seeds annually. Despite these mitigating circumstances, this is seri­ous issue among organic growers and in developing countries, where the practice of saving seeds is the norm for farmers who are not growing hybrid crops. Inclu­sion of “terminator” genes means that these farmers can­not take advantage of improvements brought about by genetic engineering without being brought into the economic cycle that profits the seed companies. Without profit incentive, however, these companies are unlikely to invest in improving crops. This issue is analogous to that faced by pharmaceutical companies developing new medications against human diseases. Clearly, it is a difficult and divisive social issue. 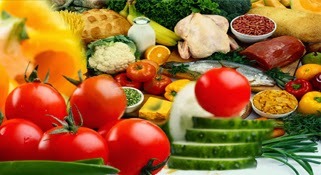 Transgenic crops and their resulting foods in the United States are extensively researched and reviewed by three federal government agencies: the U.S. Department of Agriculture (USDA), the U.S. Environmental Protec­tion Agency (EPA), and the U.S. Food and Drug Administration (FDA). Each agency is responsible for a different part of the review process. USDA has primary responsibility for determining if a new product is safe to grow, while EPA reviews the product for potential impact on the environment. FDA is concerned with protecting the consumer and has final authority to declare if a product is safe to eat. Considerations about food from genetically engineered crops have raised a host of questions about effects on the environment, economic impacts, and eth­5 BIO- 3 Use of Biotechnology in Agriculture—Benefits and Risks CTAHR — May 2003 ics. However, perhaps the most fundamental question about such food is whether it is safe and wholesome to eat. Before field testing any new transgenic crop, companies and research institutions must register with USDA for field testing permission. Researchers must ensure that pollen and plant parts of the tested plants are not released into the environment during this period. Transgenic crops must also pass scrutiny of the EPA, which has the authority to regulate all new pesticides and genetically engineered crops. EPA is concerned with potential impacts on nontarget species and endangered or threatened species. Finally, any foods derived from transgenic crops must pass FDA inspection. Current law requires that foods from transgenic organisms must be labeled as such if their nutritional content or composition differs significantly from their conventional counterparts or if they pose any health risks. Both the National Academy of Sciences and the FDA have determined that, in general, foods derived so far from genetically engineered organisms are as safe as or safer than con­ventional counterparts. The main concern is remaining vigilant for potential allergens. Common wheat (Triticum aestivum L.) is placed at the number one position among the staple foods of the world and it is the main source of calories, protein, certain vitamins and minerals. Pakistan has been divided into number of production zones and being staple diet of inhabitants, wheat occupies a central position in the agricultural of great agro-ecological areas where wheat is grown. The zoning is mainly based on cropping pattern, disease prevalence and climatological factors. Wheat cultivation encompasses a major production area of 8.33 million hectares engaging 33 per cent of the cultivated area of the country each year and exhibits production around 21 million tons. The same is not sufficient to meet with the country’s ever-increasing population growth rate of 2.6 per cent annually. Wheat occupies 70 per cent of Rabi season (winter season) and 33 per cent of total cropped area of Pakistan. Wheat is subjected to number of diseases caused by fungi, bacteria and viruses. Among viral diseases, the major problem becoming aggravated by day in Pakistan is Barley Yellow Dwarf Disease (BYDD) caused by Barley Yellow Dwarf Virus (BYDV). BYDV has serious impact on grain production and considered to be an important limiting factor for yield wherever cereals are grown and average yield losses due to natural BYDV infection can range between 11 and 33 per cent. BYDV is neither mechanically transmissible, nor through the seed, but are transmitted by insect vector (aphids) in a persistent, circulative but non-propagative manner. Environmental factors play several important roles in the BYDD cycle. High light intensity and relatively cool temperatures ranging 15-18(C generally favor expression of symptoms development, such as leaf discoloration, which may attract aphid to virus-infected plantsDominant gene, Bdv1and Bdv2confers tolerance to BYDV in some wheat varieties that induces slow yellowing. 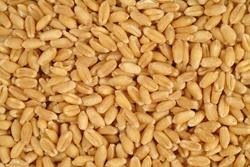 In Pakistan, total nucleic acid (TNA) of growing wheat varieties should be evaluated through polymerase chain reaction (PCR) assay using Bdv1andBdv2gene sense and antisense primers to check the presence or absence of resistance against BYDV. The 1% increase in BYDD incidence reduced the yield from 20 to 50 kg/ha in wheat crop and BYDV can be controlled mainly by the use of plant lines that are tolerant or resistant to certain BYDV isolates. The resistance or tolerant wheat varieties and insect vector management will enhance the yield of wheat crop in Pakistan and. High yield will improve the farmer’s income and it can play a significant role in the GDP of the country. All content provided in this blog is published for learning purpose only. We keep the original article source or author name for articles.